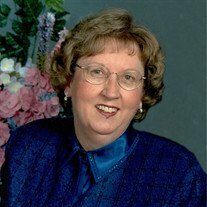 Lawanda K. Harnish, age 74, of Marlboro, passed away at 5:57 p.m. Tuesday, February 12, 2019, after a short illness with her family by her side at The Cleveland Clinic. She was born August 5, 1944, in Lebanon, Missouri, to Max and Mabel (Willhite) Hammond. Lawanda was a graduate of Willow Run High School in Ypsilanti, Michigan and attended the Great Lakes Bible College in Lansing, Michigan. She was a member of the Marlboro Christian Church where she taught 2 and 3 year olds and was active in Mission Ministries, and organized the Sunshine meals and assisted with funeral dinners. Lawanda was employed by the Berean Christian Store in Canton for more than 20 years and was manager of the gift department. She enjoyed family vacations to Cape Hatteras and the Smokey Mountains and most importantly, taking care of her family. Survivors include her husband, Pastor Ed Harnish, whom she married June 25, 1966; daughter, Lisa (Frank) Yost of Wooster; son, Jay Harnish and companion, Kerri Richardson of Ferndale, Michigan; four grandchildren, Nathan, soon to be wed to Kari Simmons, Alex, Emma and Jacob; brother, Dean (Becky) Hammond of Wilmont, Kentucky; sister, Pam (Jerry) Kelly of Shreve, Ohio; and many nieces and nephews. Services will be held at 11 a.m., Saturday, February 16, 2019, at Marlboro Christian Church with Pastor Ed Carter officiating. Friends may call from 5-8 p.m., Friday, February 15th at the church and also from 10-11 a.m., prior to the service Saturday. Interment will be at Marlboro Cemetery. Memorial contributions may be made to Marlboro Christian Church 9383 Edison St. Alliance, OH 44601.